Packed with protein, calcium and iron, quinoa makes an incredibly filling breakfast. 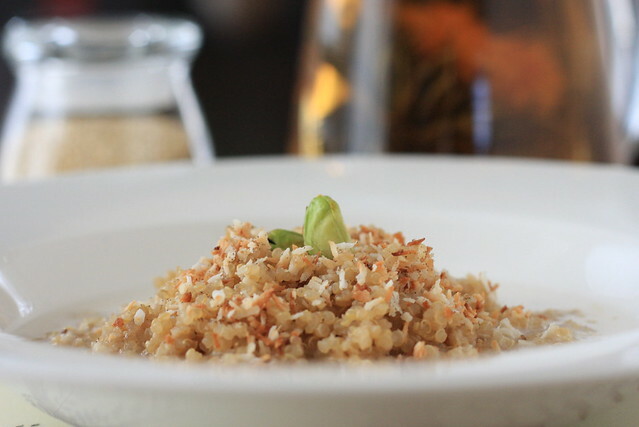 I especially love it smothered in a combination of Earth Balance, toasted coconut, cardamom and pistachios—which provides the right amount of richness to perfectly compliment quinoa’s uniquely light and fluffy texture. This recipe is perfect for a workday breakfast, and makes enough to last throughout the entire week. Place the water and quinoa in a medium-sized saucepan. Bring it to a boil, then immediately reduce to a simmer. Cover and allow to cook for about 15 minutes. Remove from the heat. Allow it to remain in the pot covered for an additional 5-10 minutes. Remove the lid. It should now fluff easily when stirred with a fork. Add in the Earth Balance, agave, cardamom and salt. Lightly toast the coconut in a small pan over medium heat for about a minute. 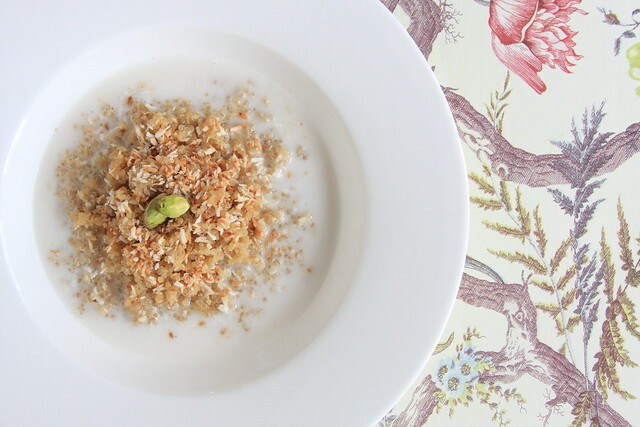 To serve, sprinkle with some of the toasted coconut, pistachios and a splash of vegan milk. You know, as I was cooking my oat groats the other morning, I started wondering how quinoa would be for breakfast. You've convinced me – I'm trying it! Quinoa for breakfast. Brilliant idea! A breakfast standby turned on its head. I have never had quinoa for breakfast! But the combo of cardamom and pistachios is quickly making it to the top of my list of things to eat in the morning. Yum! Mmmm, I like your addition of cardamom and pistachios. My favorite combo is a mixture of quinoa, millet and steel cut oats mixed with apple and cinnamon. A New Logo to Kick Off VeganMoFo!